In November, we focus on Japanese master Shôhei Imamura, with reviews of A Man Vanishes, The Ballad of Narayama, Pigs and Battleships and Profound Desires of the Gods, an article on his 1960s heroines and a Reel Sounds column on Black Rain. Out at the cinema are gleefully gross shocker The Human Centipede 2, much loved French classic Les enfants du paradis, compelling Norwegian junkie tale Oslo, August 31st, Ken Kesey and the Merry Pranksters documentary Magic Trip, twisted Japanese thriller Revenge: A Love Story, British ghost story The Awakening, dark comedy Black Pond, Errol Morris’s Tabloid and Australian serial killer movie Snowtown. We have an interview with Terence Davies about his war-time story of complicated love The Deep Blue Sea and we talk to Michael Shannon about the affecting American tale of personal apocalypse Take Shelter. In the DVDs, we review Mikl&#243s Jancs&#243’s revolutionary film Red Psalm and we have a feature on Berlin duo Stereo Total and their score for Underwater Love. We have an article on David Lynch’s soundtracks of decay, a piece on Lawrence of Belgravia and the last part of our London Film Festival coverage. We preview brilliant Japanese cinema festival Zipangu and we have a Comic Strip review on Abraxas, about a Buddhist monk musician. In Alter Ego, Welsh writer Vanessa Gebbie wishes to be Gozzi the gunsmith in Day of the Jackal, and in the Film Jukebox, ex-Baby Birkin Raechel Leigh Carter recommends ten lesser known Klaus Kinski films. The Art Theatre Guild of Japan: Julian Ross talks about the summer’s seasons of experimental and independent Japanese cinema of the 1960s and 70s. In the 60s, the Art Theatre Guild of Japan (ATG) in Tokyo became the centre of a vibrant independent filmmaking scene, encouraging bold experiments and innovative collaborations with other artists. 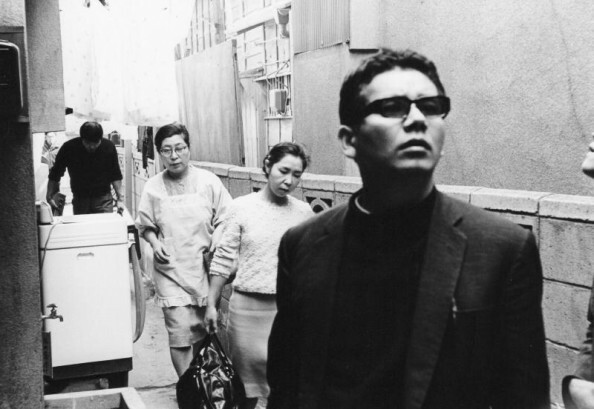 The discussion focuses on the ATG, its related space Theatre Scorpio, and the films the ATG helped produce or distribute, including works by Nagisa &#212shima, Kôji Wakamatsu and Shôhei Imamura.